Nine years ago today, I set up a Blogger account, took a laydown photo of the outfit I was going to wear that day, and posted it online with a two-sentence description. The photo was grainy and dark, taken on my bed. The words I wrote were vague. The name I chose for my blog, So What If I Like Pretty Things, was complicated & unmemorable, and totally un-marketable - because in those days, blogs weren’t marketing. They were awkward public diaries, or passion projects. I was a weird, awkward girl navigating a weird, awkward world, trying to find inspiration and a voice. It is so hard to believe how much time has gone by….!! What’s changed for me? Quite a lot. I’ve moved states and cities, changed jobs. I’ve grown up…a lot. I’ve gone through periods of both unbridled pain and expansive joy. Honestly, though I’ve retained a few of my signature sharp edges, I’ve gotten softer, and I’m proud of that because its not easy be vulnerable & open when your tendency is to close up and live in your own head. What’s changed for my little blog? Very little. I still post what inspires me: style, music, things I read. I’m still awkward in front of a camera. I still get an enormous amount of joy in documenting and writing about beautiful things. Despite the shifts in what bloggers are supposed to be, I’m not a brand. From the beginning I knew the point of this wasn’t to make money, and it never will be. I still believe getting dressed is a form of daily personal expression, and that finding bits of beauty in life is critical even when the world has gone crazy. I post fewer of my own outfits (largely because I’m too lazy to take pictures anymore 😂), but other than that this little space is still essentially the same! What’s next? The coming year may bring a few changes in content, maybe a redesign, maybe more posts about cooking, or travel, or a personal story here and there…but mostly it’ll be the same. I’ll post about stylish people, trends, spaces that inspire me, music I’m obsessing over, cocktail recipes, and podcasts & books I’m addicted to. For about 90% of my life, I have been smiley to a fault. I rarely cried as a kid, I can always find a reason to laugh, and I attach like a magnet to the places, people, and things that make me happy. This perma-lightheart has always been one of my strengths, but of course, every strength has it's corresponding weakness: I still, as a 30 year old woman, struggle with how to be sad. This might sound odd...but go with me here. There have been a few short periods in my life when I have been desperately, deeply sad. They've been brought on by various things...general existential angst, soul-crushing breakups, periods of painful transition, feeling helpless in the face of impending doom around the world. Each time I entered one of these periods I felt scared because I didn't know how to live through it well. I didn't know how to have perspective about sadness, or soothe myself, or take care of myself. I didn't know how to be sad without judging it. Sadness was a something-is-off feeling to me, like some foreign thing had taken up camp in my soul. I always treated sadness like a sickness: when I get sick or injured I get deeply frustrated with my body, and spend every drop of energy obsessing about getting back to "normal" again, completely missing the point that my body needs to feel what it feels...probably needs to slow down for a minute, probably needs the nutrients in that chicken soup, probably needs the healing that comes from sickness. Well, guess what? I'm still learning here. I went through a few weeks of real sadness earlier this spring, and I tried to treat it differently this time. I tried to listen to my soul and acknowledge all of its angst, and sit with it patiently instead of feeling afraid and frustrated by it. Tried to remove the judgement of it, and just let it be. It was not easy. I'm not going to pretend it was. But I did find a few things that were deeply helpful, including....surprise.....MUSIC. I was on a walk listening to an episode of NPR's Code Switch (which is a truly phenomenal podcast BTW), and a guest on the show mentioned the song "Trouble In Mind" by Nina Simone. They cut to the track, and all of a sudden I was crying on the sidewalk. The lightbulb went off and I marched home to make myself a playlist which I named after my favorite line from that song: "I won't be blue always." Because that's the key: I've learned I can feel blue, and let it wash over me, and be okay with it, as long as I remind myself that it's never forever. The dawn always comes. The knowledge & reminder that sadness is not permanent is what helped me move through this spring with as much calm as I could. If you're in a season of sadness, this one is for you. You won't be blue always, but while you are I believe these songs will provide some comfort. You've got this. Make some soup, curl up for a couple hours, and let these songs help the healing. I don't have my ears pierced. I know, weird. (According to a 2005 Chicago Tribune article, the percentage of American women without their ears pierced hovers somewhere between 10-20%. Crazy, right??) I wasn't allowed to pierce them as a child, and that combined with my fascination with vintage fashion lead me to amass a collection of clip-on earrings starting at a young age. I got them at thrift stores, or dug through bins at Claire's looking for the once-in-a-blue-moon pair of clips. When my grandma passed away my Mom even gave me a few of her vintage clips and I became utterly obsessed. By the time I was old enough to pierce my own ears I had such a great collection of clips that I didn't feel like it. I still don't - even though clip-ons aren't easy to find. Weirdly, having the constraint of a restricted supply helps me to stay thoughtful about the earrings I already own. One of my ultimate life goals is to be a fabulous, totally bald 90 year old with huge clip-ons and orange lipstick, and you bet I'm keeping all these earrings around for the journey. Here are my favorite places to score clips. 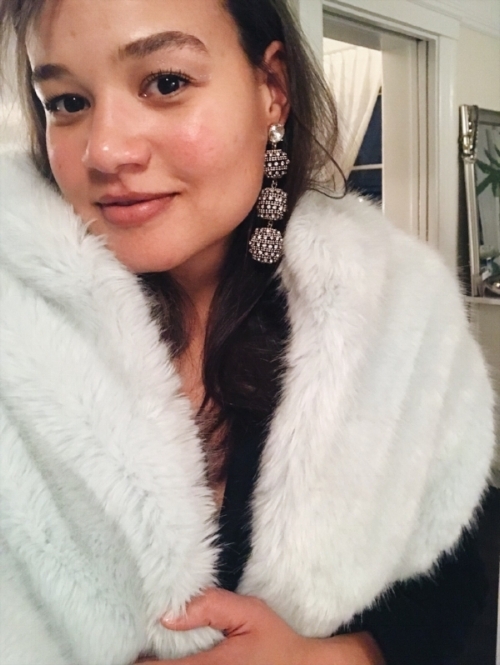 Many of the most glamorous, statement-y, and inexpensive earrings I own are vintage. Clip-ons were once way more prevalent than they are now, and everything from your local Goodwill to an Antiques fair will likely be stacked with them. My best advice is to look for pieces that stand out, that still have all of their gems/parts - and I generally avoid the type that screws into the back of your ear because they huuuuuurt after about 2 hours of wear. From left to right in gallery above: Elsa Schiaparelli crescent clips found at the Alameda Antiques Fair, $40. Vintage clips from Goodwill, $4. Hand-me-down vintage earrings from my best friend's Grandma. Gold circle drop-downs, Ballard Consignment store in Seattle, $10. I stumbled across Hart Hagerty and her gorgeous earrings while scrolling through Instagram several months back and I have become 100% obsessed. 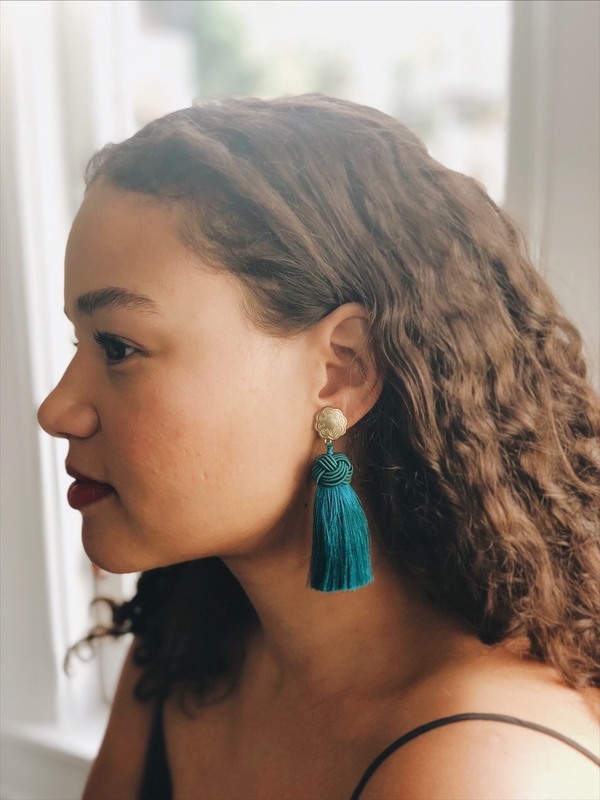 She makes silky, wiggly, shiny tassel earrings in every length and color combo under the sun, and almost every style is available in a clip!! (She also makes the necklace of my dreams: the Janus lucky coin.) I love wearing these with a simple black or white tee, vintage-feeling jeans, and minimal makeup. I have two pairs: the Long Topknot in black (which is on sale!) and the regular Topknot in a blue that's no longer available. Believe it or not...Banana Republic! Full disclosure: I work at Banana Republic HQ. And you may think that means I know something about our product line...but in truth, my job is pretty much as far removed from product as you can get. I found these while shopping on Black Friday for a friend and literally squeaked with joy when I realized they were clip ons! I wore them New Year's Eve and felt so delightfully Gatsby I couldn't stop playing with them all night. There are a few other pairs currently on sale that I've got my eyes on, most notably the Opulent Floral Statement Earring. To be sure, the great bulk of the earrings at BR aren't clips, but there are a few hiding in the bunch and when they're good they're GREAT. Etsy is a magical treasure trove of discoveries to be had. It's wonderful but overwhelming - I sometimes have better luck searching for categories or sellers on Etsy through Pinterest. That's how I found Oksana and her shop My Crystal Market - she makes beautiful glass bead clip-ons in a zillion colors, shapes, and lengths. They feel very sturdy and handmade, and make any outfit (even a boring one) feel considered. Etsy is also an amazing place to score vintage clip-ons if you don't live near thrift or antique stores. I've had my eyes on these for months, and basically every pair from GiSoutache Jewelry makes my eyes pop out of my head. Do you have any clip-on sellers you love?? Any tips for scoring great ones? I'm always all ears!! I did it! My Month of No-Shopping! I've officially made it 31 days with absolutely no shopping!!! 2) My many years of working in the retail industry and being a voracious lover of style and fashion have lead me to a lot of consumption without considering the "whys". It started in college when I'd head to Forever21, buy a cheap poly-blend cocktail dress, wear it once to a party, then inevitably give it away to Goodwill. Last year it was jeans: I'd see a gorgeous pair, try them on, love them, and buy them - without any consideration whatsoever to whether or not I actually needed another pair of jeans. 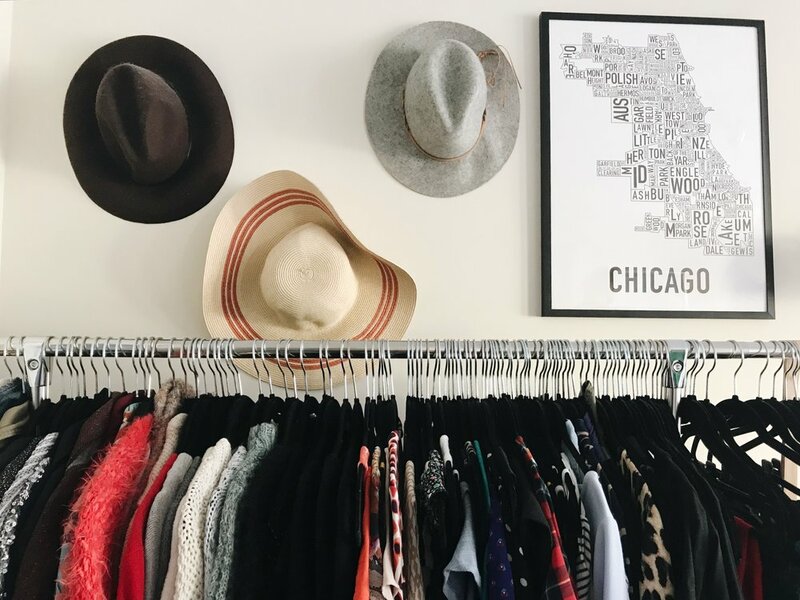 I've always been drawn to sustainable, recycled fashion and truly loving the things you own - I've been a thrifting & vintage addict since day 1. But that more thoughtful part of my brain is so easily distracted & overruled by shiny things. And it was in distracted moments I'd find myself returning home from a day out with a new almost-perfect dress, a kind-of-cute sweater, or they're-close-enough-shoes. When I'm tired, or frustrated, or needing distraction, shopping is the thing I choose. I enter a browned-out state of stimulation, wandering shops, imagining myself as a girl with flawless cat eyes (Stila) and tousled hair (Ouai), in the perfect high-waisted denim (Levi's) and loose-knit sweater (Maiami), in gorgeous leather booties (Sezanne), with a flawless shoulder bag (Annie Bing). I spend a little while imagining myself as someone else, someone polished and composed, someone who couldn't possibly have whatever trivial issues I have. That brings temporary relief. I spend a couple hours wandering, see some beautiful things, then wake up back in my apartment with shopping bags of stuff I 100% do not need. After I finally noticed the pattern, I felt pretty gross. I kind of couldn't believe I'd fallen into the murky, totally irresponsible land of mindless shopping. But instead of feeling terrible about it and/or ignoring it, I wanted to change it. I wanted to prove to myself that I can be excited by beautiful things without needing to own them - that I can draw way more inspiration by being awake and intentional than letting endless style stimuli overtake my sense of self. There's so much about the fashion world I dream of changing one day, both through my habits as a consumer and as a retail professional - and the major point I want to drive home is that endlessly, unintentionally buying things is terrible for the earth, terrible for the us as buyers, and terrible for all of the people & resources used carelessly on the way. I chose not to shop in January so I could plug back into what I already own and love - to see if I could listen to what's underneath the desire for distraction, still feel inspired, and start to live out the ideologies of consumption I've come to believe over the years. A hat & boots I hadn't worn in forever, getting some love earlier this week. It's not like this is easy. There are no simple solutions for freeing yourself from consumption mistakes you've already made. As my first act for the year, I decided to give away a couple of bags of clothes I no longer wear for all the usual reasons: my closet was packed, I wanted to downsize, I hoped that someone somewhere could use the things I wanted to unload, I wanted to start fresh. All of my clothes were turned down by THREE DIFFERENT ESTABLISHMENTS (Goodwill, Mission Thrift, and Buffalo Exchange) because guess what guys, these places are literally overflowing with people just like me trying to unload their complicity, trying to free themselves from endless consumption, trying to downsize and find some clarity, hopeful that they're doing something philanthropic but fearing deep down that we're only adding to the problem. I'd never seen it laid out so starkly in front of me: even donation drop-offs that could theoretically sell my $60 sweater for $5 had to turn me away. So how am I dealing with the things I tried to give away? I'm sitting with them, I'm owning their existence in my life and recognizing that even if I never should have bought them, I can't just cast them off into a landfill to free myself of the guilt. I'm re-examining, re-imagining, recycling, finding new ways to wear them. I'm trying my best - it's clumsy (and pretty embarrassing to trumpet out into the internet lollllllllll), but I am trying. So how'd the month go? It has been incredible! I'm having a blast trying to use old clothes in new ways, and am finding myself turning to way more lovely vices in moments of boredom: playing violin, going to museums, walking irrationally long distances, writing letters, listening to podcasts, digging through old art school notes, making new cocktails, reading new books, planning even more elaborate weeknight dinner dates with my boyfriend than usual. I've been mostly free of my desire to shop (exceptttttttttttt for this gorgeous Banana Republic coat, these Sezanne boots that are literally torturing me, and Glossier's lush fragrance You - hey, it's gonna take time, right?! ), and I have a little more cash in my pocket this month that I can invest toward long term financial health. It's been so good that...I'm gonna keep it going. No-Shop-February, here I come!